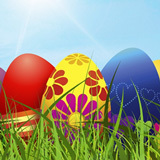 Over the Easter holiday weekend, the $1000 Easter Slots Tournament at Intertops Poker and Juicy Stakes Casino will feature four top slots from Betsoft. You'll earn tournament points when you play Rook’s Revenge, Giovanni’s Gems, Weekend in Vegas and Treasure Room. They’re all found under the Betsoft tab in the poker room’s casino. You'll be competing with other players for $1000 in prizes. You’ll earn one point for every spin of ten cents or more on any of the featured games. The player with the most points by Sunday night wins the $400 first prize. $1000 Easter Slots Tournament prizes must be rolled over only once (on Betsoft games) before withdrawal. Giovanni’s Gems, a fast-paced 7x7 slot, takes players on an unforgettable adventure with Giovanni the Gem Hunter. Exploring a hidden cave deep in a forest, players discover a dazzling rainbow of gems. Five matching symbols triggers an explosive win on cascading reels. Everyone's favorite Aztec Chief is at it again in the amazing Rook’s Revenge slot, also with Cascading Reels. In the heart of the rainforest a hidden treasure vault awards free spins where cascading wins award an up to 15x multiplier. Weekend in Vegas features three hapless characters heading out for a trip to the Capital of Second Chances. In the Bonus Round, each of them has their very own playstyle – high risk, balanced and cautious. Bonuses include generous Scatter Pays, a thrilling Money Wheel and Wilds that offer up to a 2x multiplier on wins. Players discover treasure chests, gold bars, jewels and priceless coins deep inside a buried cavern in Treasure Room. The Sword and Shield instant bonus can award up to 550 credits.